FreeTV - The Free-to-air digital tv FG Launched - Are You Using it? What is happening with the Free to-air- digital TV launched by the federal Government? It seems lots of people have abandoned it. At launch, the FG said the new Free-to-Air television had wide range of channels so that it could compete with foreign satellite televisions such as GOtv, DSTv, and the Startimes. But right now, complaint are coming from right left and center. 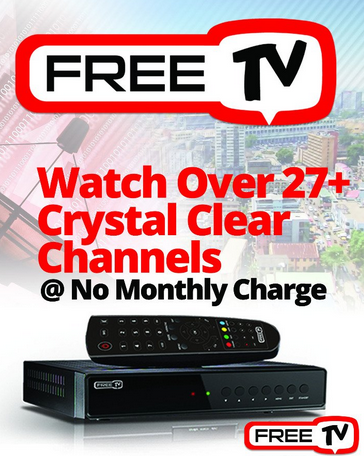 The Free to air decoder dubbed FreeTV comes with 30 channels but some persons are only able to access few of the channels. Other complaints include lack of BBC, CNN, Super Sports, among others as expected by users. FreeTv covers 6 locations which includes; Plateau, Abuja, Kwara, Kaduna, Enugu and Osun State. How much is the Decoder? Those of you using this Free-to-air decoder, how has been your experience so far? have not heard about dis free tv before. i spent almost a year in kwara and did even see anytin like freee tv decorder. i really dnt know who’s is using it..
so lagos is nigeria right?. The free to air is part of the analogue to digital switch over initiative and it was launched first in plateau state in 2016 by NBC, it is kind of worrying that 2years after they are yet to cover half of the states in Nigeria because from my understanding the country was given a deadline of 2017 by the international telecommunitions union(ITU) to switch over after we missed the previous deadline of 2015. Have heard of this before oh. Can anything done by the Nigerian government be so successful? Rubish! have not heard of this free to air decoder but notwithstanding how do you expect quality when it lacks proper budgeting. #1500 ! Gather all the state channel past the content it offers. No even public awareness. No advertisements. Dy need to improve the service and go online Instagram Facebook Twitter to market it. I heard a friend talk about this but never saw it up close. I don’t know about it. This free stuff may not show premium channels. It’s a welcome development but poor management and corruption in every post is always the problem. Prof thanks for the airtime. I know this doesn’t concern the topic. Prof or any knowledgeable user in the house, how do I go about receiving and cashing out a check from surveysavvy…has anyone done that before? The decoder is now sold for 3500 in plateau state no longer the initial 1500.
Who expects anything good to last from the Federal Government. It’s no surprise at all to hear this.